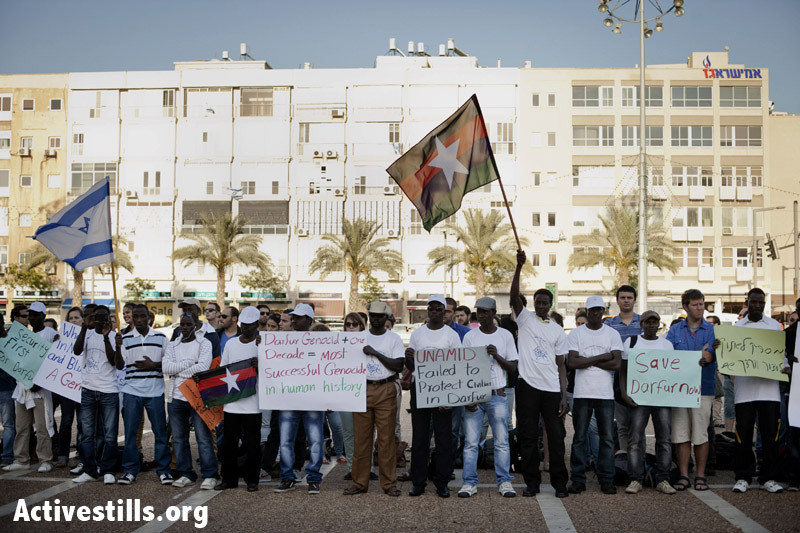 Saad (not his real name), a survivor of the genocide in Darfur, is one of the thousands asylum-seekers the Israeli government wished to indefinitely detain at the Holot facility and one of the few who managed to subvert the State’s plan, at least temporarily. Only few asylum-seekers can afford to hire a lawyer to file a petition against their detention in at the Holot camp. Among those who can afford it, many have been able to delay their detention, mostly because the Ministry of Interior did not conduct hearings before summoning asylum-seekers to Holot, thus contravening Israeli administrative law. Following a petition filed by the Hotline for Refugees and Migrants on behalf of Mutasim Ali, the Executive Director of the African Refugee Development Center, the Ministry of Interior began in June 2014 to hold hearings ahead of summoning asylum-seekers to Holot. Thus far, however, it would appear that those hearings benefited mostly married men and fathers who succeed in proving that there are married or have children in Israel. The State of Israel did not bother with filing an indictment against Saad. Instead, he was jailed under the “Criminal Procedure,” which allows Israeli authorities to indefinitely detain asylum-seekers suspected of crimes without trial or even an indictment. Many asylum-seekers were unfairly jailed under this Criminal Procedure, including people who were accused of stealing the bikes they were riding on because they did not carry a receipt for it. Saad was sent to administrative detention in Saharonim immigration prison, and despite numerous requests of the Hotline to release him, the Administrative Tribunal at the detention facility kept extending his detention. While in prison, Saad filed an asylum claim in February 2013 (until late 2013, asylum-seekers could only file for asylum from prisons). On February 20, 2013, Saad underwent an interview to examine his asylum claim. He hasn’t received a response since. To date, not even one Sudanese national was granted refugees status in Israel. In September 2013, the High Court of Justice voided the 3rd amendment to the Anti-Infiltration Law unanimously. The nine judges of the expanded panel ordered the State to release the detainees jailed under this unconstitutional law. Instead, the government chose to pass a new amendment to the law to bypass the ruling, which created the Holot detention camp, and then moved the asylum-seekers detained in Saharonim to Holot. When the law was voided, Ministry of Interior officials informed Saad that he is about to be released. Instead, the Knesset completed passing the new amendment and Saad was transferred to Holot, without any hearing or explanation as to why he was to be detained in Holot. While Holot is described by the Israeli government as an “open facility”, all the asylum-seekers detained in it have to report to three roll-calls per day, sleep in the facility and are forbidden from working. The location of the camp, near the border with Egypt, ensures that the asylum-seekers cannot reach any large population center and come back in time for the next roll-call. After a month of detention in Holot, Saad decided to leave the detention camp, even though if caught, he would have been punished by incarceration in Saharonim prison. After a few weeks of enjoying his freedom, Saad came to the Hotline to find out what he can do to stay outside of Holot legally. The Hotline decided to file an appeal in his case. In the appeal, written by Adv. Ruth Hostovsky, it was argued that Saad was wronged by the system: He was jailed for over a year for being suspect of a crime that is not punished this severely even when the person is convicted for it. In addition, Saad was denied a hearing when he was jailed in Saharonim and then again when we was transferred from Saharonim prison to the Holot detention camp. As part of our petition, we asked for an interim order that would prevent Saad’s arrest and detention in Saharonim and then Holot. Justice Mordechai Levy accepted our request and stated that “the rule about the obligation to hold a hearing is one of the rules of natural justice.” He added: “the rule of holding a hearing demands that an administrative body not infringe upon the rights of a person unless it first provided him with an adequate opportunity to present his claims before it.” Justice Levy also rejected the State’s argument that summoning a person to Holot does not infringe upon a person’s right to liberty and therefore, there is no need to hold a hearing before issuing the summons. Before the hearing on the petition was held, the Prosecution approached us and offered to hold a hearing for Saad. During the Ministry of Interior hearing, Saad and Adv. Hostovsky argued that he does not meet the criteria of being jailed in Holot, since he entered Israel after 2010, and that he does not meet the criteria of the Criminal Procedure as he does not pose a threat to public security, and that he should remain free for humanitarian reasons after spending over a year in illegal administrative detention. The Ministry of Interior accepted our claims and ordered to revoke the summons to Holot for Saad. He was given back the stay permit he held before his arrest.